After a bit more than 3 months, we bid the Dominican Republic a fond adieu! I am writing this on our third day at sea, in the middle of the "Mona Passage" between the DR and Puerto Rico. I think the biggest difference between cruising and going on a week's vacation is the ability to really get to know a place, to immerse yourself in the culture. This includes learning what makes Spanish rice yellow, how to say, "Thank you very much, but I already have a chicken," climbing the highest mountain, finding the most remote beach, and most of all....looking under the lid of paradise to understand both the exceptional & not so exceptional qualities of a people/culture. On behalf of myself and my fellow cruisers who weathered the hurricane season of 2003 in Luperon, I can say "mission accomplished". Whether by motoconcho, or gua gua, or burro, we have explored all corners of the DR. All of us have made life long friends, some have fallen in love and decided to stay. Last Friday, a blowout costume party marked the end of hurricane season. Between Presidente beers and bad karaoke, the conversation centered around who was leaving to go where and when. It looks like over the next 3 weeks, about 80% of the boats will be moving on in groups of 2 to 10. We were one of the first groups, having left the next evening. Chuck and Michelle from Cherry Bowl; Gillian & John from Jockey Holla; Jesse and Lori from Jeito. Local horse guide Tabaco rides in as an aboriginal Dominican, and the boat kids of the harbor comes as the Luperon cheerleaders. Originally, Barb & I were planning on heading straight to St Thomas to visit with some friends, but our roller furling has been acting up and needs a couple of parts. Seems that the only ProFurl dealers in the Caribbean are in Puerto Rico. This is a blessing in disguise though, as most of our favorite cruising & adventuring friends will also be stopping in Boqueron (on the Southwest corner of Puerto Rico) over the next couple of weeks. Although I yearn for a secluded anchorage off a deserted island, it is a real pleasure knowing that we will be consistently anchoring next to good friends as the next eight months bring us down the chain. It's the Saturday after Halloween, about two in the afternoon and six of us sit on the back of "First Light", a 44' Gulfstar owned by Don & Marcy, studying the weather faxes that Randy has printed off in the last hour. 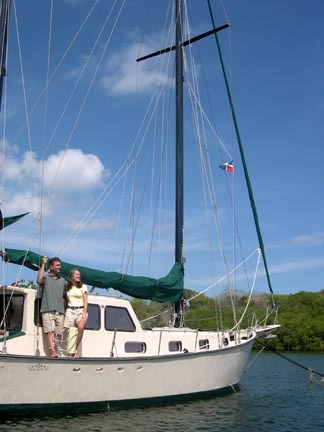 Randy is Captain of Aditi, a 36' Erickson and is sailing with his girlfriend Reggie. The 24 and 48 hour forecasts look great with 3-6 foot waves and 5-10 mph winds. The 72 hour, though, shows a mild front moving up from the Caribbean Sea. With only a 72 hour window, the time to leave is now. "Can we straighten, stow, stuff, puff, and pull up anchor by sundown?" Don asks, eyeing the rather treacherous harbor mouth, that none of us wants to navigate after dark. Randy studies his waterproof mickey mouse watch intently and slowly counts to three. Three hours, Randy and I leap over the stern rail into our inflatables and zip back to our long-anchored yachts to prepare for departure. I don't want to give the impression that we were totally unprepared for leaving. The boats were fueled, watered, provisioned, and we had our exit stamps (despachos). However, at the party Friday night, we where under the impression that the weather window would not open until Monday. On a cruising sailboat, all items are stowed, stashed, and lashed. Turn it on its side and shake (not an uncommon occurrence), and nothing will rattle except the occasional toothbrush or paperback. Take the same boat and anchor it in a calm harbor for 3 months and it is transformed into a HouseBoat, which is a vessel of a different demeanor. "I'm sure this all fit when we got here," Barb mumbles two hours later as she wedges a frying pan into our "pots" cabinet. Meanwhile, I have discovered that the Brass & Stainless steel padlock which holds our 15 hp Mercury securely on our Avon Inflatable, has undergone severe electrolysis, which has effectively welded it shut (see Electrolysis). Thirty minutes later, sore-armed & sweaty, dull hacksaw in hand, I am a wiser man. We weigh anchor as the sun dips below the horizon, leaving us with the false illumination of twilight to navigate the shoal-ridden harbor mouth, marked only by floating Clorox bottles. "First Light" eases in behind us and I hear Don mumble something on the VHF about younger eyes and why don't we lead out. Well, that makes sense, although I didn't notice he wore glasses. We meet Aditi a mile off shore, and in beam-reached formation, head east along the Dominican North shore with a rising moon and two-foot seas. That lasted for about 18 hours. As we turned south toward Cabo Cabron, on the Eastern Tip of the DR and the beginning of the Mona Passage, the winds clocked around to their normal SouthEast tendency at about 15 knots, which means beat on our bow. Randy radios from Aditi that he has an intermittent fuel supply problem combined with a small engine and would not be able to gain easting by motoring, but would have to fall off and proceed to Puerto Rico in 3 to 4 long tacks. With 3 sheets at her disposal, Solace is an exceptional sailing vessel, but doesn't point well, a requirement when trying to make headway into a beat wind. The balance to this is that we have a honking big engine and over 200 gallons of diesel, so we can gain significant headway motoring into the face of the wind. Knowing that both Twilight and Aditi can point up at least 20 degrees higher than Solace, it no longer makes sense to travel quite so close together. So here I am, 40 hrs into what will most likely be a 72 hr trip. The sun has just risen into a clear blue sky and the water is dark, dark blue. Barb is napping down in the stateroom after her 4 hour nightshift (full of thundersqualls, variable winds up to 40 knots, and spray-in-your face, which she handled beautifully while I slept). We are proceeding along the edge of Hourglass Shoal on a direct SE heading for Boqueron. I've heard horror stories about the Hourglass, since it is where the currents from the Caribbean Sea and the Puerto Rican trench meet. But for now it is only 5 foot seas, long and wide. Feels like a rocking chair on steroids, comforting if you are not prone to motion sickness. While I type, I'm ever aware for the slightest tug on either of the trolling rigs straining on the fishing platform. My uncle Sonny was nice enough to rig Pink Squid and Cedar Plug while he was visiting a few weeks ago. I'd sure like to fill the freezer with a big Bull Dorado. Wonder who will make it to Puerto Rico first?